Linux® for System z® offers many advantages to customers who rely upon the IBM® mainframe systems to run their businesses. Linux for System z takes advantage of the qualities of service in the System z hardware and in z/VM® , making it a robust industrial strength Linux. This provides an excellent platform for hosting Oracle® solutions that run in your enterprise. 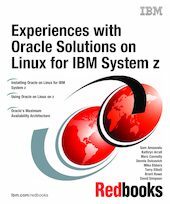 It also includes many general hints and tips for running Oracle products on IBM System z with Linux and z/VM. Interested readers would include database consultants, installers, administrators, and system programmers. This is not meant to replace Oracle documentation, but to supplement it with our experiences while installing and using Oracle products.